Michelle Breen is a librarian at the University of Limerick. Michelle manages the library’s communications, conducts a range of assessment activities and performs research linked to customer service and quality initiatives in an academic library. Michelle has presented widely on information management and assessment topics and has had her work published in peer reviewed journals, conference proceedings and LIS practitioner literature. Michelle is an active member of the LAI, advocating for CPD for library staff and she acts as a moderator and content creator for the Rudaí23 MOOC. The Chair of the Rare Books Group David Meehan of DCU welcomed an enthusiastic group of librarians and archivists to the Chester Beatty library on November 24th. 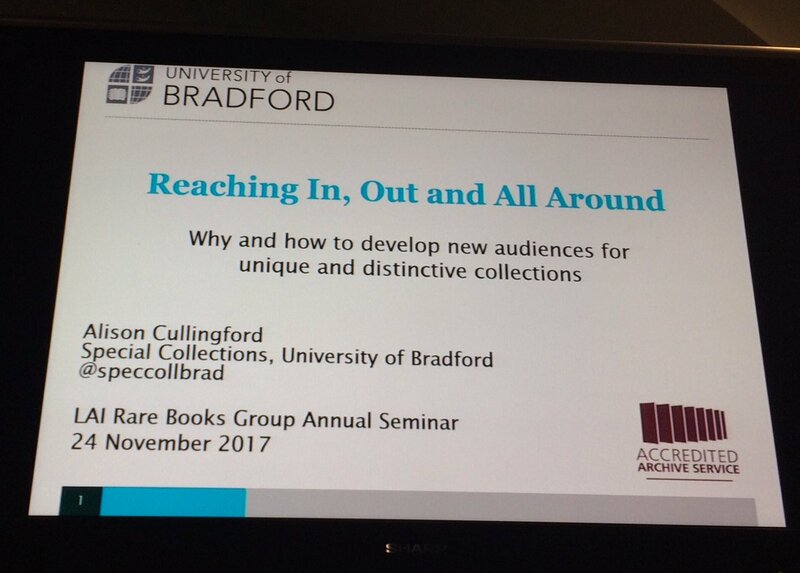 The delegates from all over Ireland’s museums, archives and libraries, (academic special and public) discussed how to bring new audiences to Special Collections. I am a member of the LAI and treasurer of the Western Regional Section so I know first hand the value of the contributions of the various sections within the LAI but I must confess this was my first Rare Books Group event. It won’t be my last. I am also a member of CONUL’s Communications & Outreach group and I am very interested in Outreach and how libraries can become better at it. I won’t repeat here all of the topics and talk titles from the programme, you can view a summary on Twitter at #RBGseminar17 or view the speaker details on the programme. 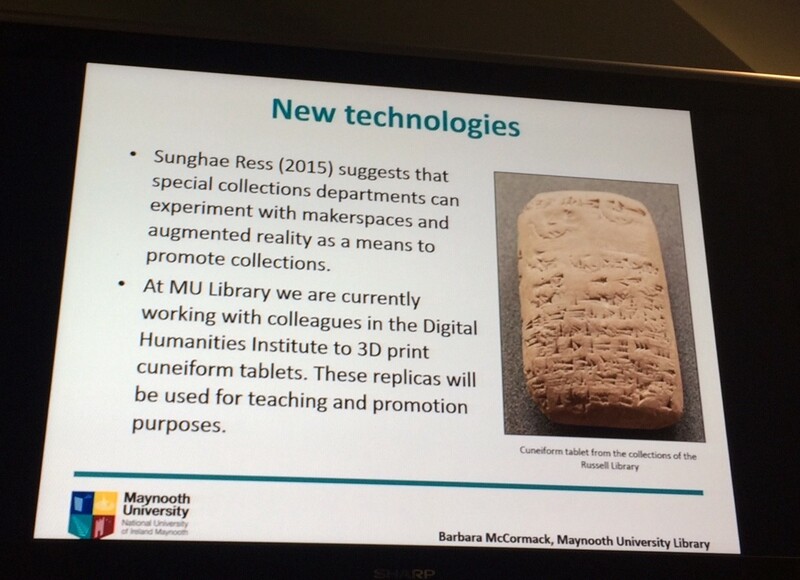 What I found most interesting on the day was the different successful approaches to outreach that are being practiced in Irish libraries and archives. Outreach is defined as "an organization's involvement in the community," so libraries who provide services to their external audiences are ticking one particular type of outreach box. However, outreach to traditional audiences could be considered a declining business. The traditional scholarly or academic community is moving online because that is where they expect to find the material they want for their research. Inreach, (which is outreach inside your organisation) could therefore become a significant strand in your library’s activities, engaging your most loyal supporters, already key stakeholders, in your collections and what you are trying to achieve through them. Perhaps you’ve lost the outreach opportunity to the family historian with the growing dominance of Ancestry. But there are new audiences out there; children, teenagers, and young people for whom there is a resurgent interest in the past. Is it the 1916 factor? The public has an insatiable demand for history at present. Giving teachers, learners, senior citizens, and occasional users a helping hand in our libraries is crucial for libraries. With community impact highlighted through funding agencies such as the Wellcome Trust it is smart to think about outreach to these new audiences. How do we ‘do’ Outreach? Doing outreach is hard when there are physical barriers in the way of your collections. The very thing you want to show off is under lock and key, so consider your audiences as if they were going to be guests in your home. Send them an invitation, make the environment welcoming, provide a hot or cold drink, give them Wi-Fi and access to the bathrooms. They are your guests! Run a lunchtime lecture, don’t be afraid that only 5 people will turn up, they WILL tell their friends, and you will get more people the next time. Consider carefully where you host your event, the hard to access parts of your campus or building or town might provide mystery and intrigue to your audiences and they might be thrilled to be there. Do good signage, promise them coffee and they will come. Plan your event carefully and you will naturally find the collaborators you need. If you are in the glorious position of being able to design a seminar space, like the beautiful seminar room in Chester Beatty Library, then ask your audiences what they’d like to see in there. Make it clear what you can offer them, what they are getting when they come. If you are ever in need of advice about Outreach and how to do it well I recommend you tap in to the expertise of the Rare Books Group of the LAI. I am sure that their chairperson David Meehan can steer you in the right direction or you can ‘reach out’ to them through their Twitter account or their webpage. Keep up the good work everyone at LAI RBG! Go raibh maith agaibh.